In the apparel business, before accepting the finished goods from the manufacturer buyer do an inspection of goods. As the whole lot of goods inspection is not viable, also not advisable, inspection is done on the sampling basis. In inspection how much percentage of defective pieces will be accepted depends on acceptable quality level. In the following table, a sampling plan is given for final shipment inspection. 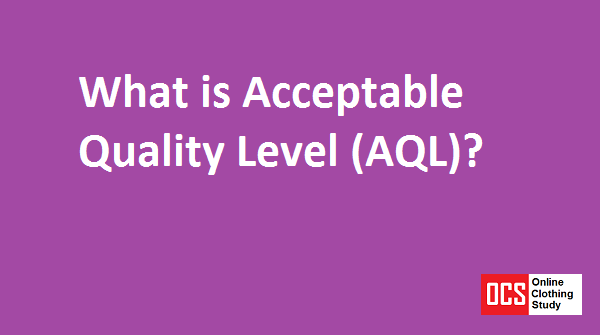 The AQL level varies process to process, product to product and even buyer to buyer. The AQL (Acceptable Quality Level) is the maximum percent defective that for the purpose of sampling inspection can be considered satisfactory as a process average. How to Read AQL table? Sample size Code letter: This code is indicative of a range of batch size. (Code 'G' means your lot size range is from 151 pieces to 280 pieces. Sample size: It means that how many pieces will be picked up for shipment inspection from the total offered pieces (Batch). Ac (Accepted): The number in this column denotes that if the inspector finds up to that much defective pieces the shipment will be accepted by the buyer. Re (Rejected): On the other hand number in this column denotes that if the inspector finds that many defective pieces or more than the listed number, the shipment will be rejected (or asked the manufacturer for 100% inspection and re-offer for final inspection) by the buyer. Suppose you have been offered a shipment of 1000 pieces for inspection. Select the range from the table, it is 501-1200. Now from the AQL table, you need to select the number of samples you are going to actually inspect. According to the above AQL chart, you need to select 80 pieces out of 1000 pieces. Now assume that you are inspecting at 2.5 AQL. So, after inspecting all 80 pieces if you found 5 or less than 5 defective pieces, you need to accept the shipment. And if you find 6 or more than 6 defective pieces in 80 samples, you ned to reject that shipment. Learn about what does AQL mean in product quality inspection, shown an AQL chart and guide on how to read the AQL chart.